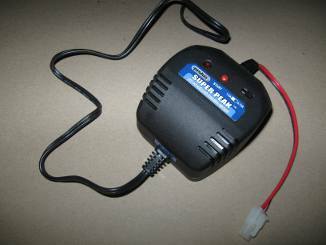 What RC battery pack is best for your radio controlled boat and wallet? Learn the differences between LiPo, NiCad, NiMH, LFP, lead acid and dry cells. Selecting RC battery packs for your model boats can be a challenge. There have never been so many options as there are today. For model airplanes and helicopters much easier - the highest power density you can afford is the ultimate solution. For boats it's not so cut and dry. The same rule applies if you're racing or like to live 'on the edge' in terms of performance, then by all means, every gram counts. But you also have to be prepared to pay up. For the rest of us, there is often a more tempered solution where value is the operative word. Most radio controlled boats are not competition class, but rather casual model boats. For instance, say you're building a scale model of a tug boat. Paying top dollars for the most compact and light RC battery pack, while loading the model boat with pounds (or kilos) of lead for balance, makes no sense. To aid in the search for the best value RC battery packs for your needs, here are some aspects and features to consider. Almost all batteries for RC models today are chargeable. Some of the battery types can be charged with the same charger, but a few cannot. You also have to make sure your charger is compatible with the voltage and amp rating of your battery pack. Here is a typical battery charger for NiMH or NiCad RC battery packs. The cost of a charger is something that also needs to be factored in your overall project cost. So while you shop for batteries, compare the cost and performance of the chargers to go with them at the same time. That way you could save yourself an unpleasant surprise. The battery pack is useless without the charger anyways. A cell is an individual unit inside a battery pack. A type of cell or battery is defined by the chemical composition of the guts inside it that store the electrical energy. Different types and/or technologies effect the performance of the cell. Voltage, capacity, weight, size and internal resistance varies with the chemistry of the cell. The voltage of a cell varies with the type as well. The purpose of making a pack from several cells is to increase the overall voltage beyond that of a single cell. It is generally best to use the highest voltage that the rest of your system will permit. Motors especially will run more efficiently at a higher voltage. Typically the Electronic Speed Controller, or ESC, is limited to 12V, so don't go over or you'll fry it. A note about Lead Acid cells - The actual voltage at full charge is generally quite a bit more than the nominal voltage printed on it and may therefore damage sensitive electronics if you're not careful. The unit of measure that indicates the energy content inside the battery pack. 1Ah is the norm, so at that rate you should theoretically be able to draw one Ampere for an hour. RC battery packs come in many shapes. This six-cell, 7.2V 1800mAh NiMH is fairly generic by today's standard. At the same token, logic says that you should be able to draw 60 Ampere for a minute. Unfortunately, the losses increase quite a bit as the current draw increases, so be happy if you'll see 20-30 seconds worth at that rate. The capacity of a battery deteriorate over its life. It simply loses its ability to keep the charge. The Capacity rating doubles as an indicator as to how long it will take to reach full charge. Again, not counting for the losses. Commercial Hobby RC battery packs come with different standard connectors. A few have emerged as standard in the hobby. Most common are Tamiya, Traxxas, Deans or EC3 connectors. Sometimes adapters come with the battery packs. Make sure you get a pack that fits the connector on your ESC. Please note, all battery packs ought to be recycled. Regardless of type, they do contain traces of material that don't belong in the environment. NiCad or NiCd is short for Nickel-Cadmium Cell. They have been around for hobby use since the 1970s and are today reasonably priced. There are a few drawbacks though. First, Cadmium is a heavy metal and a pollutant. Secondly, they are sensitive to capacity loss, especially if they are charged before becoming completely flat - they develop what the industry call a "memory". On the upside, they are durable and can handle repeated high current draw with modest power loss. They can be charged either slow or quick without detriment. Another benefit is a very low self-discharge. If handled right they can last a very long time. A NiCad cell is rated at 1.2V, so a battery pack will be rated as a multiple of 1.2. Most common are six-cell packs of 7.2 Volt and seven-cell at 8.4 Volt. The capacity is typically 1.8Ah (1800mAh). Smaller packs are available for park fliers and radio receivers. NiCads are on their way out, replaced with more potent technologies. If you are just getting started in the hobby, avoid NiCad since they have more disadvantages and will gradually be phased out. NiMH, or Nickel Metal Hydride cells have been around since the late 1980s. NiMH are similar in performance, but have many advantages over NiCad and have steadily been taking over applications where we used to see NiCads. They boost a much better power-to-weight ratio and are much less harmful to the environment. They are sensitive to overcharging, so they need special chargers that detect when the cells approach full charge. Generally NiMH batteries have a higher self-discharge than NiCads and are also sensitive to over-discharging. NiMH are also rated at 1.2V per cell, so the number of cells and rated voltages are identical to those of the NiCads. The biggest difference is in the capacity. A typical NiMH RC battery pack of the same size as a NiCad can hold almost twice the capacity. LiPo or Lithium-Ion Polymer go by many names: Li-poly, Li-Pol, LIP, PLI etc. LiPo batteries have been around since the mid-1990s. LiPo batteries are lighter weight than any other common battery type for the same capacity. Each cell will provide about 4.2V at full charge, so a pack need less cells reducing insertion loss in the internal structure. LiPo batteries disadvantages include sensitivity to over-charging and over-discharging. When over-charged they have a tendency to explode or catch fire. When over-discharged, they will no longer accept a full charge, much like NiCad batteries. LiPo batteries has an advantage over other technologies where the higher power density has an immediate advantage. For model boats we're talking extreme speed boats where every gram counts and where the much higher cost can be justified. More correctly LiFePO4 or Lithium-Iron-Phosphate is similar to LiPO, but with improved thermal and chemical stability - essentially they won't burn or explode as readily. LFP as RC battery packs are just starting to come on the market and are expensive. Lead is heavy and so are Lead Acid batteries. 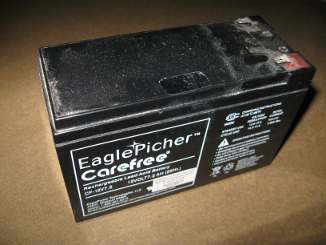 The principle is the same as with a regular car or motor cycle battery, with one big difference. The batteries suitable for RC models have the acid in gel form rather than liquid and are completely sealed. They can therefore be mounted in any orientation inside the hull. A typical lead acid battery. This one is 12V at 7.2Ah and weigh about 10 lbs (5kg). Lead acid batteries are suitable for medium to large displacement hulled boats, such as battleships, tug boats, working boats etc. They can provide power for hours and hours in the right boat and can deliver high currents without breaking a sweat. They are inexpensive if you look at their amp-for-amp performance and are most common in 6 or 12 V. Capacities range from about 1.2Ah to several hundreds. They are often found at surplus outlets. A drawback with lead acid is that they tend to drain relatively quickly when stored and that they deteriorate quickly if left uncharged. To prevent permanent damage and capacity loss, it is a good idea to trickle charge whenever they are left unused. Lead is a heavy metal and is therefore a pollutant. The manufacture is messy and should always be recycled. Dry cells can be used in RC model boats in some applications. They work perfectly well in small models with modest current draws of up to a few hundred milliamperes. Over time, it is likely not the most cost effective alternative. If both price and performance is important, use NiMH. In this context performance means high power per unit weight. This should satisfy 80% of model boat captains out there. Lowest cost per Ah is lead acid, but not by much. NiMH is a close second. Lead Acid has an advantage for very large boats where standard NiMH would not last long enough, and the heavy weight of the lead acid battery can double as ballast. Trickle charging Lead Acid batteries can be a pain whereas NiMH require no maintenance, so has a slight advantage in that regard. LiPo packs the most power per unit weight. If price is no object, this is what you need. Does best in high performance boats.